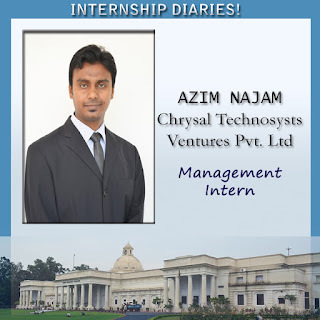 I did my summer internship in a start-up named Chrysal Technosysts Ventures Pvt. Ltd . It is an IT based organisation in Mumbai. However, my location for internship was in Kolkata. Recently, they have launched few IT solutions for HR named Abscontrack, Campustrack, Videotrack and Exitrack. My role in the organisation was of market research and lead generation. I was given the list of 200 companies which I had to pitch. In the later part, I took the help of fundodata and dataguru for data collection. I pitched for the product in different sectors and in different fields. I initially started with calling but later on did many door crashing which helped a lot. During my internship, I learned a lot as Kolkata is a completely different place to work as told by my head of sales Mr. Amit Sen Gupta on the very first day. I realised it as I progressed during my internship. After 2 months of rigorous hard work, I was able to convince few very good companies in which talks are going on in different stages. With all these experience, I am sure working in this part of the country will help me during the professional career in the future.